In last week’s fiscal statement (aka ‘the budget’), the Australian government decided to make the poorest citizens in the world, including those living in close proximity to our shores, the target of its austerity mania. It decided to increase Overseas Development Aid (ODA) to match the inflation rate until 2018 and then freeze that contribution for the next two years after that. Effectively cutting real aid over the next four years at a time it forecasts strong growth in total national income. The Government claimed it was just a “pause” and follow several years of cuts in absolute levels of aid. The austerity is not only hampering growth in Australia and maintaining elevated levels of labour underutilisation, but, it is also revealing how mean we are as a nation. As one of the wealthiest nations in the world (currently we are ranked 2nd behind Switzerland for per capita wealth), we are now cutting into the resources we extend to poorer nations in our region as part of a mindless quest for surplus. The problem is not only the economic idiocy that underpins these cuts. The other, perhaps larger problem, of which the first is a symptom is that, as a nation, Australia is losing its moral compass. In this neo-liberal era, we have become an increasingly ugly nation – lacking in generosity to each other and to outsiders. We engage in criminal behaviour (indefinitely detaining refugees in prisons on remote islands; engaging in illegal invasions of foreign nations, etc) and punish poverty rather than do everything we can to reduce it and provide the equal opportunities to all that we so often congratulate ourselves as being champions of. We are a mean-spirited nation these days and an international pariah. There is no pride in holding an Australian passport. It is easy to live here if you have money. The climate is good, the beaches great, plenty of open terrain, great sport – but our national spirit is disappearing. While the national narrative is full of ‘budget repair’ nonsense, the majority of the population is oblivious to how national policy is being hijacked by lies. What needs to be attended to in the Australian economy at present is the high labour underutilisation rate (mass unemployment and undemployment) and the rising poverty rate. The fiscal balance is a reflection of the extensive labour underutilisation and the declining real GDP growth rate in the sense that the flat employment growth and rising joblessness has undermined the tax base of the Federal government. It is also a cause in the sense that if there is mass unemployment (that is, unemployment beyond the small amount associated with full employment – people moving between jobs etc) then Modern Monetary Theory (MMT) tells us that the fiscal deficit is too low. The first observation (reflection) is about the behaviour of the automatic stabilisers, while the second (cause) is about the discretionary policy choices made by government. Both impact on the fiscal balance. But a rising or persistent deficit is not something that should be the target of policy. A deficit of 10 per cent of GDP might be appropriate under some conditions (relating to private spending and the external balance) just as a 2 per cent deficit might be appropriate under different conditions. At times, a fiscal surplus might be appropriate. There is nothing linear and directional about it – up is not always good nor bad just as down is not always good or bad. The terminology “budget repair” assumes the fiscal balance is like a car that has broken down and needs to be fixed. It further constructs a fiscal deficit as being a dysfunction and the larger the deficit the worse the repair job becomes. The construction is invalid at the most elemental level. While the US and its allies such as Australia think that democratising nations is about invading them militarily, blasting the hell out of all and sundry, and then propping up corrupt governments which then act as conduits to siphon off the nation’s wealth and income flows to the elites, whoever they might be, it is clear that this strategy breeds contempt and spawns dangerous radical movements like ISIS to form. Australia has had the audacity to divert some of its ODA allocation, into cash that it has been pouring into PNG and Nauru to maintain the prisons that house the refugees we refuse to deal with humanely. Further cuts to aid where it supports the activities in poorer nations that we generally think are important for ‘states’ to undertake – public education and health, governance, etc – will only exacerbate these global instabilities. Australia, now, has an appalling record in terms of ODA. And as it embraces the mindless fiscal austerity the record is set to get worse. The latest fiscal projections reinforce that assessment. We are really becoming a despicable nation. You will also find the resolution re-affirmed at the – World Summit on Sustainable Development – which was held in Johannesburg, August 26-September 4, 2002. This link allows you to learn about the history of the – The 0.7% ODA/GNI target. The ODA/GNI ratio tells us how much the government of any country is allocating to ODA relative to the size of the economy (the nation’s total income). There is a debate as to whether this ratio measures the generosity of a nation given that it doesn’t provide any measure of aid quality nor what happens to the aid once it is dispersed. The latter point is very important given the extent of the corruption in many nations receiving the ODA and the discussion above relative to global insecurity. It is also important in assessing the quality of what ODA Australia provides given the point above about using ODA funds to maintain offshore detention centres (prisons). Overall, total net ODA rose in 22 countries in 2016, with the biggest increases in the Czech Republic, Germany, Italy, Poland, Slovak Republic, Slovenia and Spain. For some the increases were due to higher refugee costs. ODA fell in seven countries, with the largest declines seen in Australia, Finland, the Netherlands and Sweden. Get the picture. Many nations are beset with massive refugee flows and have still increased general aid. Even nations such as Greece and Portugal, suffering from crippling austerity have increased their foreign aid in absolute terms and relative to GNI. The OECD reported that Australia cut it development aid budget by 11.1 per cent in real terms in 2015. Australia has no large refugee problem (the boats that have tried to land carry a few hundred people if that) and has not been crippled by the GFC. Yet it is cutting aid substantially. The OECD reported that Australia cut it development aid budget by 12.7 per cent in real terms in 2016 following a 11.1 per cent real cut in 2015. Conclusion: Australia is just a disgrace. I note that it was the Australian Labor Party that began the cuts in 2013 (thinking it would get to fiscal surplus partly on the back of people who are facing starvation and extreme poverty). The conservatives just carried on with this meanness. 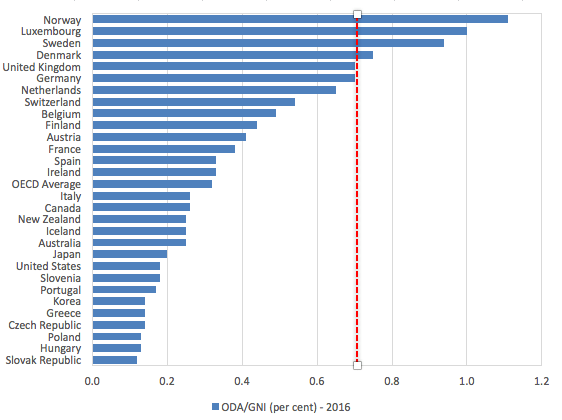 The following graph shows the real percentage growth in ODA in 2016 for the OECD nations. So there is still an on-going and massive shortfall in ODA/GNI ratios relative to the agreed target of 0.7 per cent. The OECD estimates that in 2016 the ratio for all nations was 0.32 per cent. The following graph shows the state of its Member Nations in 2016 relative to the 0.7% target. Switzerland retains first place, and its lead over second-placed Australia (USD 376,000, down USD 5,000) appears very secure … The United States (USD 345,000, up USD 3,000), and Norway are still in third and fourth place respectively. Australia is thus not a poor nation. But moreover, its government issues its own currency. 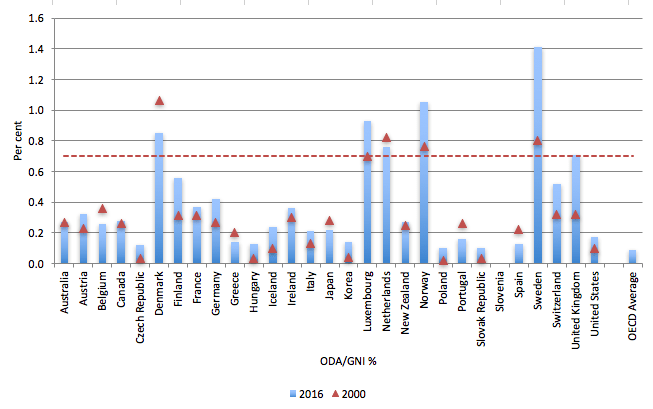 The next graph shows the movements in the ODA/GNI ratios between 2000 (red triangles) and 2016 (blue columns) for the OECD nations. The red dotted lines represents the 0.7 per cent target. Australia has made no progress over the 15 years towards closing the gap – it has reduced its ratio from 0.25 to 0.23 per cent. In other words, its promises as an international citizen are hollow. Australia likes to claim it “punches above it weight” when it is winning some sporting event but when it comes to something important like feeding starving children we largely ignore our international responsibilities and commitments. The next graph presents a longer time series view of the generosity of selected nations. The data is available from the OECD at Net ODA data. The red dotted line is the UN 0.7 per cent ODA/GNI target. I have added the latest Australian fiscal estimates out to 2020-21 to the data and just extrapolated a constant ratio for the other series shown out from the actual data as at 2016.
n the 1960s, when Australia enjoyed true full employment (less than 2 per cent with zero underemployment), Australia was among the most generous providers of ODA to the poorer nations. Our international aid assistance was very close to the 0.7 per cent of GNI range that was subsequently agreed to be the acceptable target for advanced nations. The decline began in earnest in the early 1980s which coincided with the emerging dominance of neo-liberal macroeconomic thinking which attempted to construct the aid in terms of excessive spending and a denial of other prioritised spending. This argument has especially been used during recessions where governments of both political hues have claimed that nations who are in recession no longer have the means to extend their generosity to the poorer nations. The whole construction is, of course, deeply flawed. A nation in recession that issues its own currency has no more or no less financial capacity available to provide ODA than a nation that is growing strongly. In fact, it is in the interests of a nation in recession to not only introduce counter-cyclical domestic fiscal policy initiatives but also to increase ODA because the poorer countries tend to import from the more advanced. The more income that is produced in the poorer nations the more likely it will be that the exports of the advanced nation will hold up or increase. So this false idea that a recession reduces capacity is endemic and damaging innocent people everywhere. A nation mired in recession has more real resources available than ever and is living well below its means rather than the way the fiscal austerity proponents like to say (living beyond their means). You can see that a small nation like Norway is very generous in both absolute and relative terms. Even the austerity-prone UK has moved since the GFC to meet the UN 0.7 per cent target. Australia is slipping further away as a result of recent fiscal decisions to cut ODA. 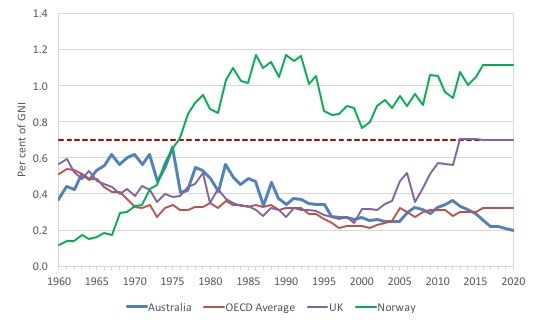 Australia is now moving towards the bottom of the OECD nations after being near the top prior to the neo-liberal era. The Government tried to claim after the fiscal statement was released that the UN goal was “arbitrary” despite all UN nations being signatory to it. I used the forward estimates including the freeze to track the intended real ODA expenditure by the Federal Government out to 202-21. I have assumed that the CPI follows the government’s projections. 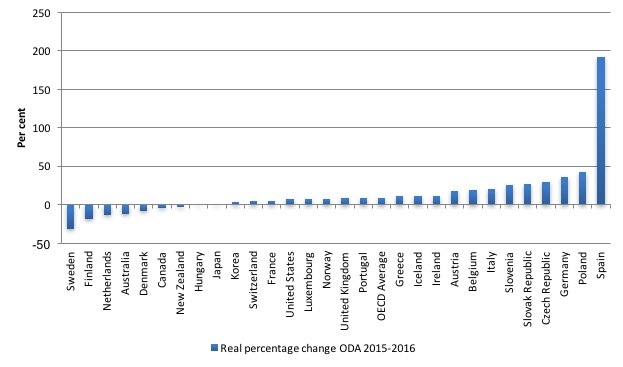 The following graph shows the percentage changes in real ODA outlays from 2013-14 out to 2019-20. The actual data becomes forward projections after 2015-16. 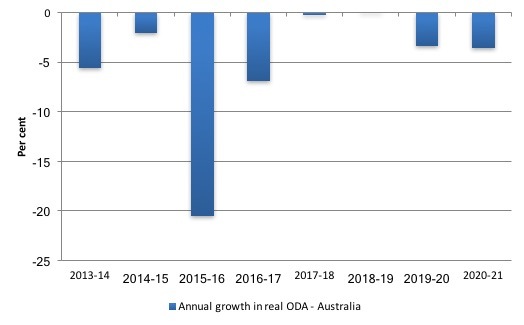 The Abbott conservative government slashed real ODA expenditure dramatically (one of the largest annual cuts in the history of the program), and the latest incarnation of this government under Malcolm Turnbull has continued the real cuts. By 2017-18, the planned ODA only increases with expected inflation so the real growth is around zero and then the level is frozen while the assumed CPI rises go on and deflate away our real Aid contribution to the world.. The projected cuts by the conservatives since they were elected in 2013 will see ODA outlays decline by more than 42 per cent under current assumptions. That is a dramatic shift in our behaviour towards the rest of the world. And when you consider that the Australian government has been counting spending on prisons in the Pacific to incarcerate refugee seekers as part of the ODA and this segment has been growing significantly in recent years, you get a good picture on why decent Australian people should be hanging their heads in shame. The neo-liberal paradigm rules the World at present and humanity generally is the victim, particularly those most disadvantaged in material terms. However, Australia seems to be implementing this disregard for other nations, especially those within our region, more vehemently than other neo-liberal infested nations (compare the behaviour of the UK under the Conservatives in recent years, for example). The on-going dilution of the Australia federal government’s Overseas Aid Program impacts materially on the capacity of aid agencies to do their work and the evidence is that they are being forced to cancel programs and lay off staff. Once again the myths of neo-liberal macroeconomics leads us to accept governments doing appalling things in our name. The Australian government should be increasing the fiscal deficit right now to ensure that domestic spending is sufficient to push unemployment down. But it also should be increasing its ODA to ensure we meet our international obligations if achieving a ODA/GNI ratio of 0.7 per cent as soon as possible. After all we promised to achieve the latter goal in 1970! Further, 22 of our nearest neighbours are considered to be developing nations. Why would we want to undercut the prospects of our nearest neighbours? Even self-interest tells us that it is foolish to leave our trading partners poor. It’s like the Marshall plan never happened. If you assist poorer nations with gifts of your currency, they tend to buy your output. Could be a description of the U.K that is about to vote in another vacuous Tory Government on the basis of grotesque small-mindedness, vacuous rhetoric of a banality hitherto unknown and a nationalism based on false explanations of the causes of national distress. We have the shameful sight of a Tory leader indulging in flag waving whilst having been part of a Government that loves globalised capital and outsourcing of anything that makes a fast buck! As a result the turkeys will vote for Christmas again. Neil I guess we need a new UN-like group of humans that can successfully place the right people in jobs to deliver aid without corruption. If we can’t do it at that level I fear for JG. Pretty appalling. We really need to get monetary sovereignty understood by our defective politicians. Then they will have to face the truth of their conduct. I thought you were describing USA in the first paragraph there. -Yeah, as the first comment has pointed out about the Marshall plan, funds flow back to developed nations because people from developing nation purchase goods from wealthy nations so those dollars go to the pockets of the developed nations themselves. When a government issues its own currency, this is a good thing to fight recession. However. even at full employment and low private debt, I’d say we should help developing nations because it is what we are supposed to do as human beings. I thought about what would happen if we deficit spend a ridiculous amount of money to give to developing nations. Developing nations don’t use US dollars exclusively to buy US goods right? so they have to convert it first to Euro or something? I don’t know if that will mess up US dollar exchange rate when we carry this to the extreme. Now, I know that USA is a very large economy that is not likely to be tanked by foreign aid and that we should only be worried about the real resources constraints of a particular policy, but I try to anticipate questions/fear-mongering from conservatives/neoliberals/cold-blooded “realists.” These people always say we are going to bankrupt the US or mess up the exchange rate so US dollars doesn’t worth anything. Anyway, I will read through Dr. Wray’s text on exchange rates. I have been slacking on that book because I have been reading some other books. My guess is that other countries will gladly take more US dollars and hyperinflation simply doesn’t happen without a huge political turmoil or supply shock. Just like the turkeys we donate our lives to our employers and the neo-liberal system but we need to meet the disposal costs of our bodies when we die. The UN is only a puppet for the USA and the staff in the UN also think that they should be treated in a privileged way by getting better paid than everybody else. As far as humanity is concerned, everybody in this world has only his/her interest at heart, the strong individuals exploit the weak at the base level, and strong countries exploit the weak at the top level. As far as Australia’s deficit is concerned; how much of that is created by negative gearing, dividend imputation, tax concessions for super, and the cream of all, tax-free super for the over-sixties; Australian don’t have to dodge taxes, the rich are legally protected from paying taxes. Add to that the family trusts. Caused by a Labour party that still supports the EU with its internationalism, open borders and propping up of firms that need to change direction. The Tories have an open goal because Labour refuses to accept or address the feelings of the majority of the population. Instead they cast around looking for a reason why it *must* be something else. Beveridge pointed out the issue in 1944, §36. “It is better, and less of an interference with individual lives, to control business men in the location of their enterprises than to leave them uncontrolled and require workpeople to move their homes for the sake of employment”. Jobs should go where the people are, not the other way around. If that is too expensive or difficult, then the business should invest capital in automation and innovation to lower its labour requirement. i,e. undertake some capitalism. That then drives forward productivity. The Japanese show that works – even if the powers that be are under the influence of neoliberalism. UK Labour has, unfortunately, moved away from New Labour only to become Cheap Labour because of its ideological blinkers. And it will continue to lose elections until it sees the light: jobs and income are protected by a functional local job *market* backed by an employer of last resort – not by pandering to the cat-like mewling of private business (and, unfortunately, short sighted unions looking after their own rather than the common good). Labour needs to learn to treat business like cattle, not pets. I agree Neil, but that doesn’t apply to Corbyn (who was in the Benn camp regarding the EU) but you are right about the Party as a whole. However, the media has supplied the mental wallpaper that hides the dissimulation and duplicity of the Tories. Labour is to blame in that it failed to find a narrative that made sense. The Job issue is big but so is housing. The issue of housing bubbles caused by uncontrolled bank lending hasn’t been explained properly to the populace so that too, along with jobs, gets subsumed under the ‘it’s the immigrants wot did it’ myth. I agree that immigration combined with a housing bubble and job outsourcing is a tinder box -and this has been cynically exploited by the shyster May and turned into a flag-waving extravaganza which is, in effect, an Alice -in -Wonderland inversion of the underlying reality. One of the most egregious manufacturings of consent in recent times. When you say ‘Labour has failed to address the feelings of the majority of the population’, you don’t include in the concept of ‘feelings’ that they have, to some extent already been manipulated by a dumbed-down media and bogus explanation. Remember Farage saying that housing was in short supply and expensive because of supply and demand and too many immigrants. A complete failure to explain how the housing bubbles developed from the mid 70’s onwards due to loosening of credit controls, Tories selling social housing off and banks using housing as a money machine. Non of this explained by either Tories or Labour. So we’re left with a Daily Mailised populace. The present ‘feelings’ of the populace are already predicated on the immigrant myth-how do you counter that? I Labour party canvasser in Brighton recently wrote about door-knocking in a deprived, largely social housing area where he was told by the residents that too many immigrants from the EU are causing the housing problem. He later checked the figures for the area that indicated 2% immigrant population which was non-EU. This community was 75% for the Tories. The Tories are treating these people like useful dupes. The first graph “Member Nations in 2016 relative to the 0.7% target” doesn’t match with the next one that show movement between 2000 to 2016. Shouldn’t the blue bars be the same? E.g. Sweden is about 0.95 in the first one and 1.4 in the next one. Neither does e.g. Norway, Denmark and Luxembourg fit. Sweden have also maximized the OECD allowed amount to use domestically for refuges. And still be count as aid by OECD. Some Swedish munipically is now the single largest aid recipient recorded as OECD/UN aid in the budget. Wonder how munch of today’s refugee problem is caused by neo-liberal era economics. Quite a few are basically economic refugees. And insurgent caused by economic woes. Not least due to Washington Consensus “sound finances” policy’s forced on countries in debt. EU protectorate as Bosnia isn’t even allowed to have its own Central Bank.